Hollybeary Creations : 2016 in Review!! This month at YNS we are celebrating 2016 and all of our Fabulous Releases in 2016. Join us today for a Blog Hop as the Design Team shares projects created with our favorite products from 2016! 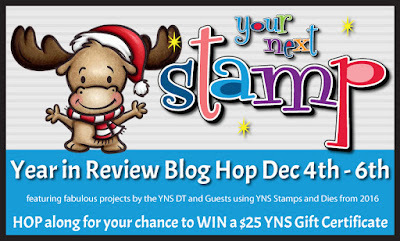 Be sure to leave comments along the way for a chance to win a $25 GC to the YNS store. I'm using the Huggles Christmas Star set that was released last month along with the Winter Scene Border Die. This year YNS also released our very own line of Inks pads and I used the Sunflower ink and mixed it up with some Glitter Bead Gel and White Embossing paste to create a fun texture for my background. I smooshed the ink onto my craft mat and mixed some of the White embossing paste into it to create the shade of yellow I wanted and then I addd in the bead gel and layered it over a star stencil. Once the panel was dry I ran it through my big shot using the Largest of the Stitched Rectangle dies. I adhered the panel to a standard Black card base. I stamped the images onto some White card stock using YNS Black Olive ink and colored them in with Copic Markers. I cut them images out and set them aside. For the background piece I die cut the Winter Scene Border die from some White card stock and adhered it with foam tape for dimension. Then I adhered the images over the background. I stamped the sentiment from the same set in Black Olive ink and die cut it using the Cool Tag 3 banner die and adhered it at the top of the background. You can curve your sentiments by reversing your block over the piece your will stamp it on. So cute!! Are you ready to Hop along and see some Fabulous projects? Be sure to comment along the way for a chance to win. Thanks for joining us! Love that sweet bear! Such beautiful coloring too! SO cute!! Love how you did your card!! I just love that bear holding onto his gingerbread man - soooo cute!!! This is so sweet! I love the great color! love the stars background!!! Huggles is too cute!!! Fantastic coloring! Love the background so cute. Such a great card...but I could not find what you used for the star background...was that a stencil? Anyway...I loved it...thank you so much...big hugs and Happy Holidays!!! Anything bear or gingerbread related is always so cute. Your card is super adorable! I love it! I need to get some modeling paste. What a cute card ! 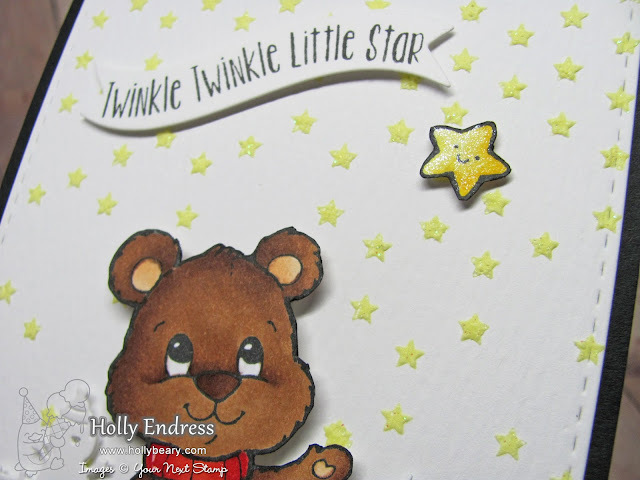 I love how you've used mix colors into the embossing paste to create yellow stars. Love your adorable card. The stars are so pretty. Very sweet card! Thank you for sharing! This is precious, Holly. Thanks for the inspiration! So cute. I like your coloring and the sparkle. What an adorable card! I just love the stars background. The teddy's are just too cute. So sweet, love your starry background! Awww!!!! Such adorable card!!! Too sweet and cute!!! Loved your fun cards Holly! You are a master at adding all the right touches on each one!